The 5th Wave by Rick Yancey was a great book. It incorporated suspense, entertainment and was overall very compelling for young teen readers. The book begins with sixteen year old Cassie, one of the few surviving humans of the four other waves that aliens, known as the Others, have created in order to kill all humans on Earth. The first wave is darkness, all electronics go out and as a result, darkness takes over the world. The second wave is a major tsunami which wipes out all coastal nations. The forth wave is disease, which is airborne, extremely contagious, and results in death. The forth wave are Others, taking the place of humans and are known as Silencers because their job is to kill humans left on Earth. Together, the four waves have killed around seven billion people. Cassie is currently living alone on the run and has a feeling that she is the last human on Earth. The book then flashes back to a couple months prior to when Cassie was traveling with her dad and her five year old brother, Sammy, after her mom was killed by the third wave. They make it to a camp with the last of the humans, which is run by military officers. One day, a bus comes and is collecting only the kids in order to take them to Camp Heaven to save them. Cassie does not want their family to be separated, but Cassie’s dad insists that Sammy has to go to Camp Heaven to remain safe. Cassie argues, but eventually loses and Sammy is taken to Camp Heaven. Cassie then leaves the camp to collect Crisco, a boy at the camp who is also young enough to qualify for Camp Heaven with a military guard accompanying her to make sure she remains safe. She finds Crisco and is about to take him back to camp when the military guard accompanying her and who is also one of the heads of the camp shoots him. Cassie then realizes that they have been tricked and the military guards running the camp are in fact Others. She runs back to camp and sees her dad crawling out, but it is too late and another Other comes out and shoots her dad. She runs away and barley escapes them which brings the book back to the present. What Cassie does not know is that a Silencer, whose job is to kill her is and has been watching her every move and is ready to finally kill her. He shoots her in the leg and she hides under a car. The Silencer decides to wait her out. He knows that if she tries to stay, she will bleed to death and if she tries to escape, he can just shoot her. The book then travels over to Sammy’s perspective where he is being taken to Camp Heaven. He is scared to go but guards comfort him and tell him that he will be safe. He arrives to camp and is checked by various doctors to make sure that he is healthy and not an Other. The book then takes place in a sixteen year old boy’s (Ben Parish’s) point of view. Ben was Cassie’s crush in high school before the Others arrived on Earth but he didn’t even know that Cassie existed in school. Currently, Ben is at camp Heaven, the same place that Sammy was sent to. It turns out that Camp Heaven is a camp where they train kids to go out and fight the Others when they are ready. Ben and his group have been training hard to become one of the four groups who are able to fight the Others. At Camp Heaven, the kids are vigorously worked in order to be able to have success on the battlefield. Sammy winds up in Ben’s group and Ben takes Sammy under his wing because of Sammy’s age. The book the goes back to Cassie’s perspective. She was saved from under the car and wakes up newly dressed in a house. She meets the person who saved her, a boy in college named Evan Walker. With the help of Evan, Cassie becomes strong enough to walk again and she learns how to use her gun a lot better. She finds Evan to be likable and kind, the only thing that is off about him is that he always goes hunting at night but never returns with anything. Now, her priority is to save Sammy from Camp Heaven and evan insists on coming with her, but Evan is not who he seems to be. Meanwhile, in Camp Heaven, Ben’s group has graduated and are ready to take on the Others, but Sammy cannot come with them because he is too young. They are given all the tools they need and are sent out to battle. However, during battle, they realize something startling that reveals the truth about Camp Heaven, the 5th Wave and the Others. 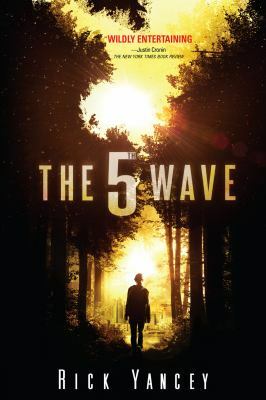 The 5th Wave is available for checkout from the Mission Viejo Library. It can also be downloaded from Overdrive.